Caleb is still in the game!!!!!! The “Beast Mode Cowboy” has made it through and is still in the game. I’m impressed. He survived the Amber non-showmance. He survived his early alliance. And on the outside, he survived controversy from some “things” he said and has a large fan base. He lasted longer than Devon, Amber, Hayden and even Donny! I was watching last Thursday’s episode and looking at Caleb and he seems so under the radar compared to the early part of the season. It got me thinking, would it be a good idea to bring him to the final two? Is he NOT well liked enough to help YOUR game to win? Or am I seeing it wrong? Is he still a threat? Does he need to be sent to the jury house as soon as possible? How far will Caleb Reynolds get? I started an online conversation last week on who we think should win this season of Big Brother. People chimed in on who they think should win. Others voiced who they’d like to see get the money. Derrick and Donny were the top two names that came up over and over in the discussion. In the middle of the thread, someone wrote, “Point is whoever wins should win, that’s how this game works.” Hmm, I guess that’s true. At first I thought the person was getting smart with me (this is online after all) but I REALLY started to think about it. Like I talk about in a previous blog What We See VS What They See, WE see all the different sides of the players and the game, The players don’t. they are going by and therefore voting on what they feel, see, or know. Because we have the bigger picture, of course we would have a different opinion to who should win. If the house guest had a glimpse into the DR’s and private conversations and secret alliances, then it would be an entirely different game. I never really looked at the game this way before. I got caught up in what I SEE and my opinions on who deserves the money based on that. Now with ALL of that said, I still know who I’d like to win the game. But…..in the end, when someone wins, it’s who SHOULD win. Right? Maybe? Kinda? Zach is voted out!!! In some ways I am kinda sad. He is so entertaining. But like I have stated in previously blogs, he also bugs me. It’s a double-edged sword for me. And he was undone by Frankie?! Wow! I have a feeling though that Zach gets that this is a game and they will be friends outside the house. Plus Zach has a chance to win Fan Favorite and the money that comes with that. The Ariana Grande is Frankie’s sister is out in the Jury house. I STILL wonder do any of the houseguests really care. I KNOW she is BLOWING up NOW, but she wasn’t huge before they went in this summer. And let me state for the record, I like her voice and music. It might matter because she is perceived to have a lot of money and maybe Frankie does too. THAT could affect votes. That competition to get back in the Big Brother House was fierce. Personally I was glad Jocosta and Hayden didn’t get back in. I was hoping for Zach (can you imagine the fireworks.) but Nicole was the winner. I wonder what she’ll be able to do. That Ice bucket for ALS challenge is EVERYWHERE!!! and it made its way to the Big Brother-verse. CBS President and Husband of Julie Chen challenged her to do it live! Then the Chen-bot challenged EVERY HOUSE GUEST WHO HAS EVER PLAYED THE GAME! And i have to say that Will Arnett (who stars on a CBS sitcom) coming out and dousing Julie Chen was fun and surprising! Its time for another elimination. Another person will be voted out by their housemates and sent to the jury house. In the jury house they will decide between the last two people standing, which one to give the grand prize. How a person gets voted out of the house and the game is interesting because the players in the game have to go by what they see and hear. As a television viewer, WE know that what they see may not be what is actually happening or the truth. That is one of the reasons that makes the show interesting. As a viewer on TV or the live feeds, we get the see everything that is said and done. We can make clearer judgements throughout the game. We get a view into what’s going on and where the players stand at any given moment. And that’s NOT to say that there aren’t surprises for us. They do happen. But for the most part we can see what the true alliances are; when the moment a person turns on their bestie back their back; when couples hook up and get together. I know there are many times I’m screaming at the TV, “HE’S PLAYING YOU! DON”T BELIEVE HIM!! !” Then I have to remember that for them, that person is doing a good acting job and what THEY SEE is a nice person who is on their side. This is a really SOCIAL game. Yes there are competitions thrown in but its ALL about people skills and how you act. How do you come across to others. Do you seem deserving of the money or not? Should you be REALLY friendly? Or it that a bad thing?! Could being too friendly put a target on you because they think you’ll win over them? Or is being seemingly open and honest the way to go. Then you can go both good and bad things and get away with it because you are perceived as a person who is who he is and that’s a form of being truthful. I do find that’s what make the game tricky. I have no idea how I would do inside the house! HAHA! So tonight one of the two nominees for eviction will be voted out and go the jury house.Some of us will be happy, some of us will be mad, and others won’t mind. I always wonder how the nominations and votes would be different if the house guests got to see video or hear audio of some of the things that they aren’t privy to? What if one of the prizes for the week would be to see a glimpse of the confessionals?! I mean obviously decisions would be made differently but how different would they be? AND how would it be for us as viewers? “Expect the Unexpected” is Big Brothers motto. And I have to say that tonight’s Battle of the Block was Really intense for me! How was it for you?! I liked this season’s twist of crowning TWO HOH’s (Heads of Household) and they each nominate 2 people for eviction. Those two sets of houseguests have to WORK TOGETHER to get off the block. That can be fun to watch especially if the two don’t care for each other. The winning “team” gets off the block and the HOH who nominated them is dethroned. I think it’s a fresh turn in the game. It adds drama and another dimension to the game that has had 15 previous cycles. Tonight’s Battle of the Block had so much going on that was spoken and unspoken. The players (no spoilers here. I’ll comment more later in the week) were all interesting players in the game. Each has their detractors and supporters. Why didn’t one of them ‘throw” the game”? Did one of the players get too cocky? Was it a competition better suited for one player rather than two? Donny’s name was spelled wrong by production (?) Cody and Victoria seemed chummy. And did one of the winners just “out” themselves? I was glued to the TV set the whole time! I’m sure EVERYONE has an opinion. HAHA! But for me it was intense and that’s what I enjoy in a competition! Big Brother 16- Its Double Eviction Week! It’s the first double eviction week of the season!!!!! I always get nervous when its a double eviction week, As a viewer, I could lose TWO players that I like! That doesn;t make me happy. AS a player, that means you have two times to try to get two players out of the game. Either way, I get on edge! I do know its good for ratings to up the drama. How does it make you feel? On the Amazing Race they have this thing called NON Elimination legs. If you don;t watch, the deal is that the last team to check in to the checkpoint of each leg of the race gets eliminated.Well every once in a while they throw in a leg where no team gets eliminated. I HATE THAT. Cause usually its a team I hate that gets saved another week! Yuck. Double Eviction weeks affect me similarly. When there is a double eviction week, it means a part of the game is sped up. ANYTHING can happen and its happens FAST! I’m REALLY curious to see how this week goes. Its hard to make bets because that second set of HOH/Nominations/BOB/POV is really anybodys guess. Its a full week played in one hour! It could be a game changing time! I just realized that I’ve never watched the Big Brother Feeds online in all the seasons its been on! I DO watch Big Brother After Dark. First it was on Showtime and now its on TVGN. 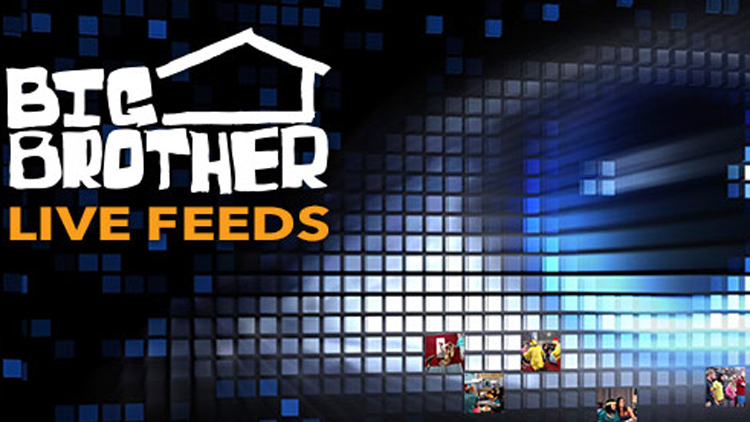 I give points to CBS, they have really taken advantage of the “big brother” theme and created an experience. You can sign up and watch online 24 hours. You can watch 5 nights a week for about 2 to 3 hrs on TV. And of course there is the actual show 3 nights week. If you take on Big Brother, then you have to be committed! Ha! If you are like me and don’t watch the feeds, then you are prone to seeing spoilers. I’m on Twitter, Facebook and Instagram and people screen shot and talk about what happens in the house all the time. So if you don’t watch the feeds, how does that make you feel? Does it minimize watching the actual show for you? Does it bother you? At first it bothered me. Since the show is 24 hrs and 7 days a week, I can’t just NOT go online to avoid spoilers. Some shows that only air once a week, you can do that. This is not one of those shows. So I know that if I go on Twitter, I might see in my timeline BB posts of stuff I havent seen. Now I am okay with that. The hour-long show can still offer surprises (especially the eviction show, since that’s the only thing revealed on the show.). Plus I have found whatever big things that happen on the feeds (that I didn’t see), I now can’t wait to SEE it on the show! Also the shows are only an hour, so there is much NOT shown on the telecasts, it’s a great addition of information. I do wonder what the numbers are of people who are watching the feeds. We know from the TV shows, Big Brother is averaging around 6 million (though houseguests on the show keep saying 9 million). And there are almost as many Big Brother related accounts as many hashtags. I follow many of them. I like the community nature of Big Brother. And I don’t have a lot of time to devote to ALL that is BB, so I like that the feeds are out there and I can go to social media and here what going on in the house. The hard work is done for me and I get the highlights. It’s a win-win.